The word revelation simply means an unveiling or the lifting of the veil. We often use the word in a religious sense as an unveiling of the Uncreated One or the essence we call God, but the word God is a metaphor that points beyond itself to what is beyond and transcends human intelligence. The word God itself is a revelation because it brings that mystical essence a step closer to our consciousness. The word God to some degree enables us to communicate with each other about this mystical essence and our experiences of it. We men have been analyzing and refining our knowledge of this Totally Other since the dawn of human consciousness. Some have even pretended to be that consciousness when men had a corporal view of God. It was the nation of Israel that first codified that God could not be imaged by the human mind, a revelation which could be traced back to Moses and his encounter with God on the sacred mountain. The Uncreated One is not a creature that man has the right to name just as Adam named the animals brought before him. Be careful about speaking of God. It’s not hard to figure out how revelation worked. In the past, men experienced the Totally Other in various ways. When they talk to others about their experience there seems to be a thread that connected these experiences, a thread which basically said that there was something beyond the mere physical. Something so lofty that the human mind could not comprehend it. It was this something that primitive man gave the title God. This helps us to understand the ancient myths. Myths mediated the presence of God to mankind through story and poetry. It was through these forms of mediation that the ground and foundation of All Beings began to reveal himself to mankind. This is why we see a thread, though sometimes thin, of the same themes in myth and story throughout the world. You could say that the myths were the temples God used as a meeting places with men. They were the bridge that spanned the chasm between the spiritual and the physical. Myths are metaphors that come alive in story form. In the New Testimony, Jesus became the living temple and bridge where man can meet God. Unfortunately, some men are metaphorically disadvantaged because of their concrete thinking, which came about by a scientism that denies anything other than our sense experiences. What about Jesus and revelation? Well, Jesus is the image or revelation of God. He said, “If you have seen me, you have seen the Father.” The apostle Paul refers to him as “the image of the invisible God.” Paul goes on to say that God packed into Jesus everything that humans could possibly know about God. So in that sense Jesus is THE revelation of God. Jesus became a living metaphor that pointed to God. That’s why John could say the word (revelation) became flesh and dwelled among us (John 1:14). He goes to say, “No one has ever seen God, but God the One and Only, who is at the Father’s side, has made him known.” (John 1:17-18) The Word, The myths, The Forms and The Archetypes all took on a bodily form in Jesus. For in Christ all the fullness of the Deity lives in bodily form, and you have been given fullness in Christ, who is the head over every power and authority (Col 2:9-10). Definition of Myth:1 a: a usually Definition of Myth:1 a: a usually traditional story of ostensibly historical events that serves to unfold part of the world view of a people or explain a practice, belief, or natural phenomenon creation myths b: PARABLE, ALLEGORY Moral responsibility is the motif of Plato’s myths. In his book “The Idea of The Holy: An Inquiry into The Non-Rational Factor in The Idea of The Divine and Its’ Relation to The Rational”, Rudolf Otto gives an excellent overview of these mystical experiences and encounters with the Totally Other. Hebrews 1:1-3 “In the past God spoke to our forefathers through the prophets at many times and in various ways, but in these last days he has spoken to us by his Son, whom he appointed heir of all things, and through whom he made the universe”. “The Varieties of Religious Experience” by William James. Also note the works of Joseph Campbell. “For God was pleased to have all his fullness dwell in him, and through him to reconcile to himself all things, whether things on earth or things in heaven, by making peace through his blood, shed on the cross” (Col 1:18-20). Many today believe that there is no God or if there is, He is distant and aloof. The first group we call Atheists and the second we call Deists. However, in scripture, both Old and New Testaments depict a God that is near. This can be summed up with the words of Saint Paul. “The God who made the world and everything in it is the Lord of heaven and earth and does not live in temples built by hands. He is not served by human hands, as if he needed anything, because he himself gives all men life, breath, and everything else. From one man he made every nation of men that they should inhabit the whole earth; and he determined the times set for them and the exact places where they should live. God did this so that men would seek him and perhaps reach out for him and find him, though he is not far from each one of us. ‘For in him we live and move and have our being.’ As some of your own poets have said, ‘We are his offspring.’ (Acts 17:24-28). In this section of scripture we see a number of very interesting things. However, for our discussion we need to focus on the latter half of the section where Paul makes some bold statements concerning the nature of his deity. He said, “God is not far from each one of us.” Then he says that we live and move in Him and we have our being in Him” In this Paul set forth a lofty and radical view of the uncreated one i.e. God, a view that is not heeded or believed by many even in the Christian movement. First, he points out that there are no sacred places in which the deity dwells. The implication is that the God of heaven and earth cannot be contained in anything built by human hands, neither can he be served by any priesthood of men. The coming of Christ has made sacred places and sacred men obsolete. In Christ, all men and places have been made sacred by the work of Christ. In this, Christ was the end of all religion as a system of mediation. What is Paul saying about God? He surely is implying that the deity is not some impersonal distant deity that has no interest in the affairs of men; to the contrary, he seems to be saying that the God of heaven and earth created humanity with a curiosity and then gave him clues in nature that would allow man to find Him. It is in these clues that man hears the voice of God. What are some of the clues that the deity gives to man? Well, he gave him the sense of awe. We humans are the only creatures that have the ability to experience awe and wonder. For that reason, we are the only animal that worships. 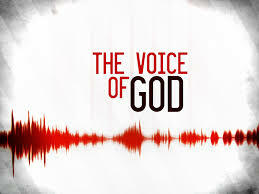 The next time you are on a high place and look out over God’s good earth and you have a sense of awe come over you, try to hear the voice of God speaking to you in that experience. It helps to be alone in a very quiet place. God often speaks in a very soft voice. The writer of Psalms said “The heavens declare the glory of God; the skies proclaim the work of his hands. Day after day, they pour forth speech; night after night, they display knowledge. There is no speech or language where their voice is not heard. Their voice goes out into all the earth, their words to the ends of the world.” It is obvious, that this man believed that when he sat under the starry sky and looked up that he could hear the voice of God. If you want to give your faith a boost, just look up. You may hear the stars speak to you of the Creator. Still, another clue might be mans passion for fairness and justice. It seems that men everywhere want things put right. Could this desire for fairness and justice be the echo of Gods voice? Could the sense that things are not right be the voice of God? There is a sense that something is wrong, echoes throughout the scriptures. “All have sinned and are falling short of the glory of God.” This is one reason why people of faith call the scriptures ‘the word of God’, because it has a ring of truth; a truth that echoes in the human experience. In his book “Man’s Search for Meaning” Viktor Frankl suggests that in every human being there is an intrinsic need to have meaning. Could this inner cry for meaning be the voice of God calling us to find our purpose in him? Saint Augustine said, “Our souls are restless until they find rest in God”. In the above Scripture Saint Paul also seems to be saying that the deity with which he is speaking about exists in another dimension, other than we humans. In fact, He encompasses all the dimensions, for He created them. Some moderns have criticized Christians for believing that God was up there in sky, but it is obvious that Paul believed God filled the entire space-time continuum and more. The mistake of some is to take literally the metaphoric language of the Bible that speaks of heaven as literally up. One thing is obvious, if Paul is right about the deity, the deists who believe in an aloof distant God are wrong in their interpretation of God’s nature. If we live and move in the uncreated one, he surely is aware of every hair on our head as Jesus said. It also seems that if we are that close to God we should be able to sense his presence. “God did this so that men would seek him and perhaps reach out for him and find him, though he is not far from each one of us. For in him we live and move and have our being.” Paul is inferring that God has revealed Himself, sufficed that men ought to seek Him and if they seek with all their heart they will find the Total Other. No half hearted search is sufficient, the true God is not easy to find. However, He is self-evident to the pure in heart. “Blessed are the pure in heart for they will see God”. Therefore, the place to begin your search is to purify your heart. When a scientist has a hunch that there is more than meets the eye, they begin to search for the answer. If they do not have the tools for their search they create them. When they wanted to search the heavens, they created the telescope. When they wanted to search the microscopic world, they created the microscope. After creating their tools and collecting their findings, they then passed that knowledge on to their disciples. Likewise, in man’s search for God, men basically did the same thing. When men beheld the greatness of creation and its order, it forced them to seek the architect that created such an awesome universe. They then created their tools that could help them find God. What are those tools? Well, it may surprise you but some of the tools are the telescope and microscopic. You see, both of these tools of science demonstrated how complex and orderly the universe really is; in that they point to and reveal a designer and a lawgiver. Therefore, in a sense they were both a word and a clue from God that tell us something about God’s greatness. The early natural philosophers (scientists) would say that there are two books which reveal God; the book of nature and the book of Scripture. Scientists study the book of nature. Theologians study the book of Scripture, both books point to the uncreated one. I personally believe that there is a third book that we could call the book of humanity. If we look at man, we see a creature, which the bible says was created in the image of God. If mankind is created in God’s image and likeness, we then should be able to learn a lot about God from studying man. The author of Ecclesiastes says that God has placed eternity in the hearts of men. He learned this about man by observing and talking to men and woman about their thought world. He concluded that humanity in general believes in more than what is seen and perceived by their physical senses. They seem to have an intuitive sense that there is something more than the scene. Could it be the sense and vague remembrance that they were created for the stars or at least another world. Could this be a clue from God? Could it be that, this sense or desire for another place is the thing that is driving modern man’s quest for outer space? Could this other worldliness be a vague remembrance of our origin and purpose? Could this sense, be God drawing us to himself and the stars? Of course, some will dismiss this as only suggestive and intuitive. However, can we totally dismiss the intuitive? I think if we do; we do so at our own peril. Not long ago I read a book on fear in which the author pointed out that many people had used their intellect to dismiss their fear to their own ruin. He pointed to numerous situations where people sensed intuitively they should not be in a place or with a certain person. Yet, they used their reason to dismiss the fear to their own demise. The question is, have many silenced the voice of God with their reason, and therefore missed some of the clues that God has given them? How about you?